Are you a Purina Cat Chow Perks Program Member? If so you are eligible to receive a free sample of the Cat Chow Naturals Grain Free Food! 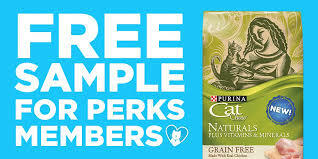 If you are a member: log into your account, click redeem and you'll receive a free sample of Purina Cat Chow Naturals Grain Free cat food in 6-8 weeks. If you are not a member: Register here, complete all necessary steps for registration. Then log into your account, click to redeem the Free sample offer, complete the form and allow 6-8 weeks for delivery. Right now you can score a bag of Purina Cat Chow Naturals Grain Free food for only $11.45 (regularly $16.99). Be sure to check the box for the extra 15% Off coupon (new price will show in your shopping cart).